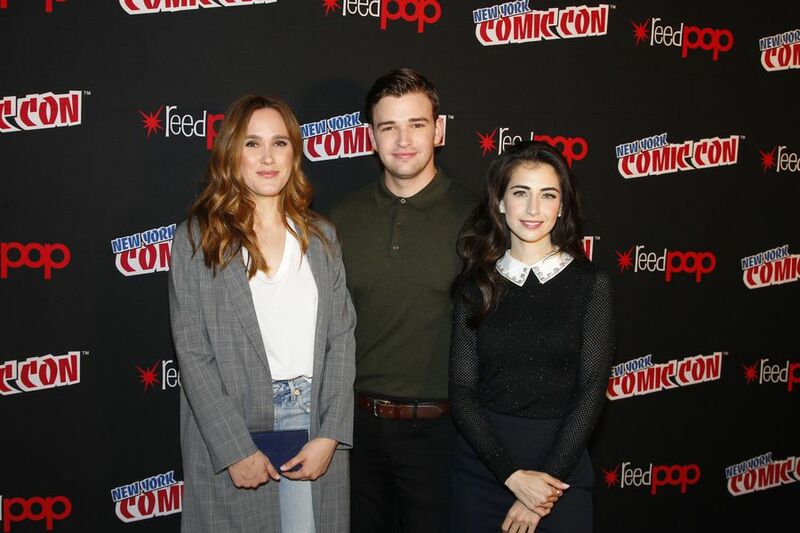 NYCC 2017: Interviews with the Cast and Producers of ‘Beyond’! In January of this year, the science fiction drama Beyond debuted on Freeform. What made the show’s premiere so unique for the network was that it was the first time the entire season of a show was available to binge in its entirety online. It was such a success, that it was renewed for a second season within less than a week of premiering! At this year’s New York Comic Con, the cast and producers of the show were present to talk to us all about the upcoming season: where they see the potential Charlie/Holden/Willa love triangle (or is it?) going, how the Realm will affect the real world, and the extracurricular heroics of the series. When asked if any changes occur for Holden in season 2, Burkely Duffield mentions Holden’s continued “want to create that normal life that he strived for in Season 1.” But as any series goes, things can’t stay all picture perfect for long. Instead of Holden seeking out the Realm, “the Realm is now coming for him,” Duffield adds. To coincide with Holden’s view of their relationship, Dilan Gwyn added Willa’s side. They both want normalcy; the problem is, “they’re not really good at being normal.” The want to be a normal couple might not be the only obstacle Willa and Holden have to face this season. When asked about the potential love triangle between Willa, Holden, and Charlie, Eden Brolin instantly shouts, “Square!” With Holden’s younger brother Luke (Jonathan Whitesell) in the mix, this plethora of love and relationships is not going to be what we expect. Leave your comments below on how you think these various relationships will unfold. In explaining what they love about the second season, Gwyn mentions how Willa isn’t always going to have the answers for every situation. They’re allowing her character to make mistakes, and not be perfect, which this writer appreciates. “I like that she was allowed to be a little bit more human, and a little bit more vulnerable,” Dilan adds. I’m curious if Holden will help her out in certain situations this time around. For Eden’s character, “Charlie gets to play a lot of dress-up,” and sneak around; that statement alone is sure to conjure up a lot of fan theories. As always with interviews, it’s the executive producers/writers for shows/films that have all the juicy details and spoilers. To sum up season 2 of Beyond, David Eick says it’s “scarier, faster, [a] much more disturbing version of the show. And at the same time, it’s funnier.” Since season 1 was the origin story for the show, in season 2 they’re able to go into more depth with the characters, their relationship(s), and “extracurricular heroics” (powers). For those wondering if we’re going to see any characters similar to Holden and his abilities – we will! His name is Edgar. Adam Nussdorf explains: “Back in 1983, he was a kid just like Holden. He went through a very similar traumatic experience just like Holden.” Now in the present time, “Edgar and Holden have more than a few things in common.” I’m curious if he’ll be more of a protagonist to Holden and company or somewhat an antagonist. But the real antagonist will be Diego, as the creative team for Beyond explain. He wants what was taken from him and will do anything to get it back. Sounds like my kind of villain. Beyond returns to Freeform on Thursday January 18th at 8/7c. The trailer for the upcoming season can be viewed below.